In the previous edition of the Football Special Report, we looked at a classic post-reunification East vs West German club clash that featured one of the greatest strikes of all time (of the hand-to-face variety rather than a football kick). Now we fast forward a few years to Estonia and one of the shortest matches of all time. Back in Supporter Snap Back #2, we talked about the somewhat regular pairing of Scotland and Switzerland in the early 90s through both international and club competition. But the Scots’ true rivals of the decade have got to be Estonia, with no less than 6 meetings between the two nations in 7 years from 1993 to 1999. Flags of Scotland and Estonia. 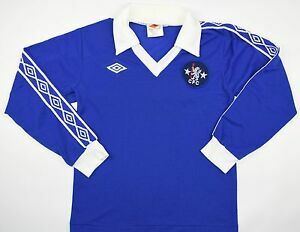 While Scotland had come off the back of World Cup 90 and Euro 92 participation when the sides originally met in World Cup 94 qualification Group 1, Estonia were participating in their debut campaign after independence from the Soviet Union and unsurprisingly it was the experienced Scots who won the first encounter 0-3 on front of 1800 fans in Tallinn in May 93. The tally was repeated in the return tie at Aberdeen’s Pittodrie less than a month later, but this time it would also be the scene of Estonia’s first ever goal in competitive football – their one and only goal in the group as it would turn out. 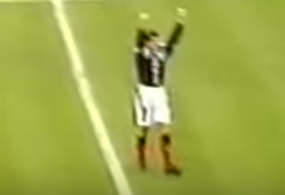 Estonia score their historic first competitive goal against Scotland in Aberdeen, World Cup qualifier, 02/06/1993. Portugal, Italy and, of course, Switzerland all finished ahead of Scotland, meaning USA 94 would be the only major tournament of the 90s that they would miss out on. After their return to a finals at Euro 96, Estonia loomed once more in the Autumn as the pair would again be battling it out for World Cup qualification in a tough Group 4 also featuring Austria and Sweden (and Belarus and Latvia). On August 31st, Scotland started their campaign with a satisfactory draw in Vienna against Austria before defeating Estonia’s southern neighbours Latvia 0-2 in early October. On the same day Estonia also picked up their first win of the group, with a 1-0 victory over Belarus after the reverse scoreline when the sides had already met in Minsk in August. 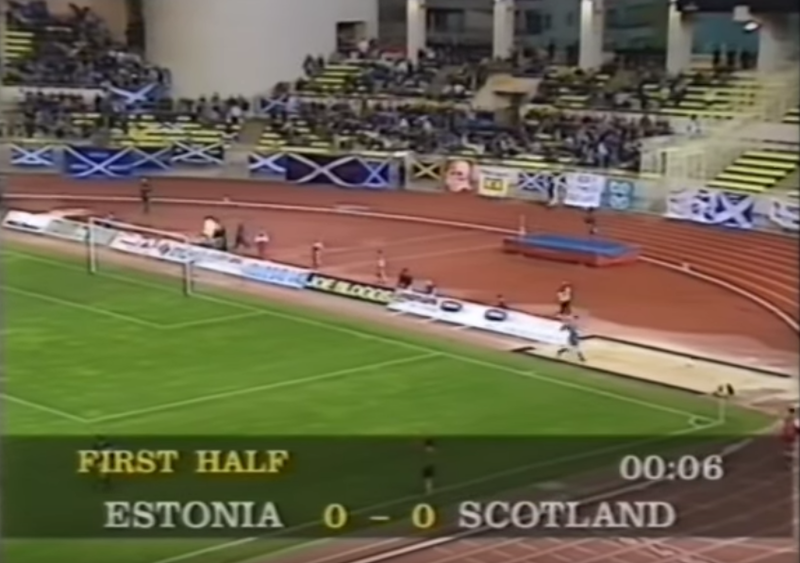 Next up, five days later on October 9th, Scotland were to play Estonia and the team made the short Baltic journey north from Riga – obviously the result of excellent fixture scheduling by the Scottish Football Association also employed by Ireland in Latvia and Lithuania in June 93. A huge away contingent of the Tartan Army had watched the Scots win in Latvia and doubtlessly many also followed the squad across the border for the second of the double header. 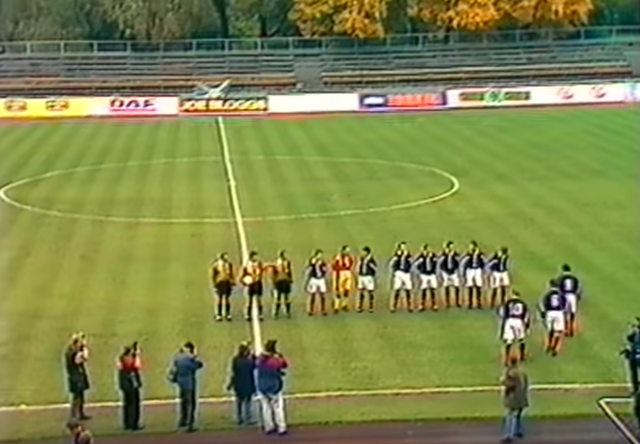 Scottish banners in Riga showing their fantastic away support, Latvia vs Scotland, 04/10/1996. 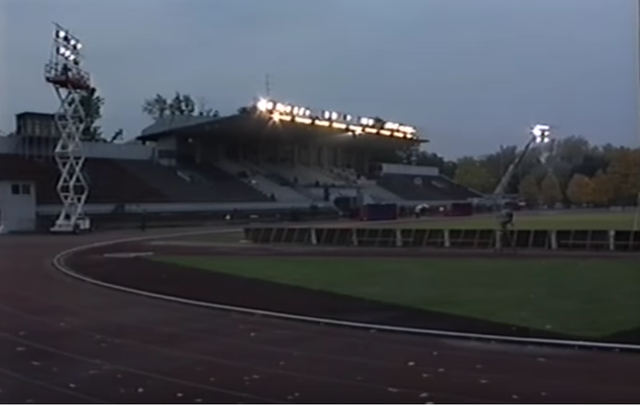 All was normal up to this point, but at the under-21’s match the night before the game the Scottish staff discovered partial temporary floodlights in Tallinn’s Kadriorg Stadium not fit for international football, at least in their opinion. After making a complaint to FIFA, the governing body’s executive committee in Zurich agreed to move kick-off forward on the morning of the match from the originally scheduled 18:45 to 15:00 local time, eliminating the need for the inadequate floodlights. 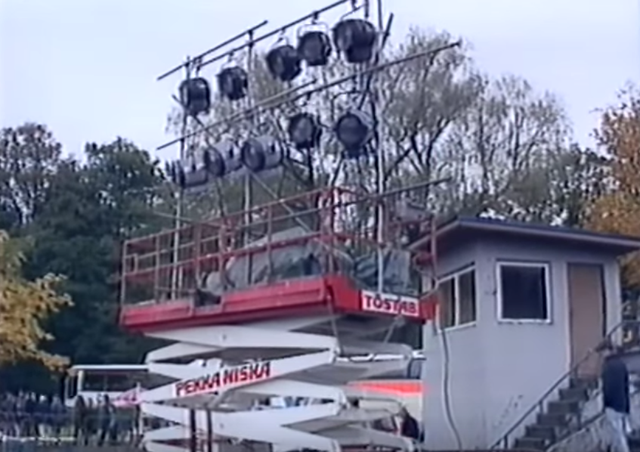 Temporary floodlights in Tallinn's Kadriorg Stadium, 08/10/1996. The Estonians were horrified at this last minute change, both from a logistical and television rights point of view, and threatened not to show up. The rescheduling also negatively effected Scottish supporters at home, as a school shooting memorial on BBC Scotland meant the game could not be shown live. Or so they thought. As it turned out there would be another difference to the Chile-USSR affair, as in this instance FIFA did not award the game to the Scots with a 0-3 walkover as had originally be expected. Following an executive committee meeting in November it was decided for the game to be replayed on neutral ground, much to the annoyance of the SFA. Accusations from some quarters were thrown at Swede Lennart Johansson, president of UEFA and chair of the committee, at attempting to give his native land an advantage in the group by forcing their rivals to replay the tie. Funnily enough, at least one player would in fact be on home ground, as the Stade Louis II was chosen as the venue – stadium of John Collin’s Monaco. 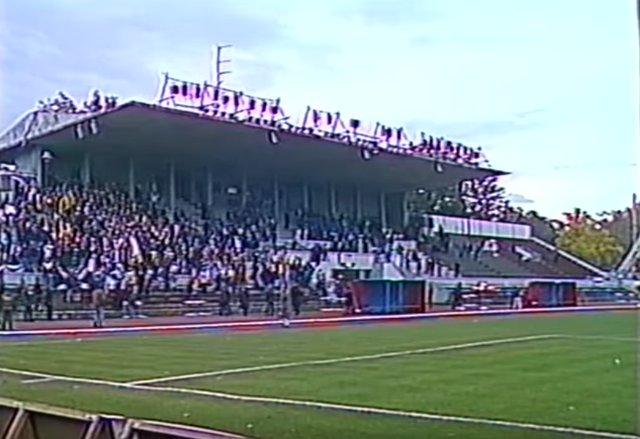 On February 11th, 1997, the game at last took place, with Johansson’s evil Swedish plan seemingly working as the Estonians were able to hold the Scots to a 0-0 draw (perhaps channeling Sweden’s period of rule over Estonia from 1558 and 1710). Monaco hosts an international; is that a totenkopf in the middle of the Scottish flags? Estonia vs Scotland, World Cup qualifier, 11/02/1997. Just over a month later, the sides would play again in Rugby Park, Kilmarnock, with a 2-0 victory for Scotland. But on April 30th, dastardly Sweden would again damage Scottish qualification hopes with a 2-1 defeat in Gothenburg. With Sweden taking on Estonia on the last game of the group, it would be nice to conclude the story with the Baltic state redeeming themselves and throwing off their Scandinavian yoke once again to cause an upset allowing Scotland to qualify. It wasn’t to be, as the World Cup 94 3rd placed team won 1-0. However Scotland’s win over Latvia at the same time, itself a former Swedish dominion, gave them 23 points anyway – two behind Austria but two ahead of Sweden. While the rest of the second place finishers entered play-offs against each other, this total made Scotland the best placed runners-up in qualifying which delivered an automatic qualification spot – much to the displeasure of a fuming Mr Johhansson no doubt. 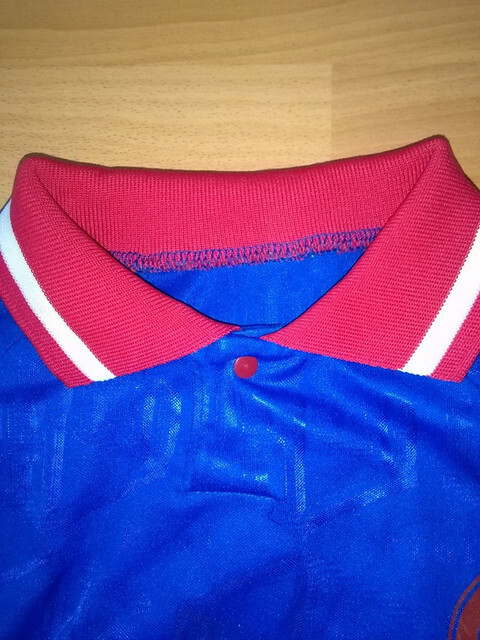 This time on Retro Shirt Reviews we have a sort of a “youth special”, with what is also the first fully identifiable club featured so far in the series, as well as TWO bonus shirts in International Selection at the end. Click here for all entries. Today’s shirt is the first long sleeve to feature in Retro Shirt Reviews and originally caught our eye last year due to the blue/red/white colourway, which we are a major fan of on kits. As with all in our collection, the shirts are purchased with the intention of being worn, but when this jersey arrived at POTP offices we discovered that it was in fact a youth team shirt which had not been evident online. It is quite a large youth shirt though and nearly did in fact fit, but not quite. Never the less we held on to it, since it is quite an interesting top and well worth discussing. 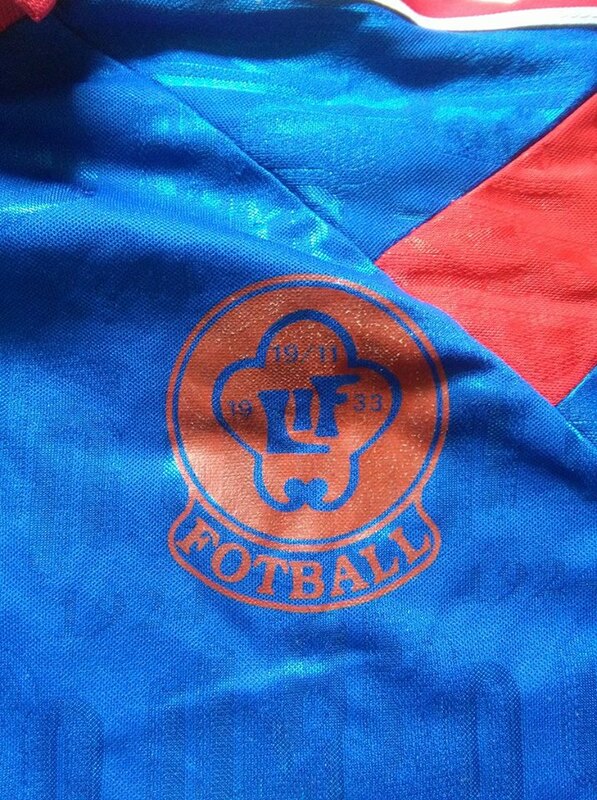 It is hard to make out the crest in the above picture due to the nature of dark red over blue and how the crest was printed on, but it is indeed that of Norway’s Lørenskog Idrettsforening. At the time of writing, Lørenskog are a member of the Norwegian “2. divisjon”, which of course like in many countries is in fact the 3rd tier. 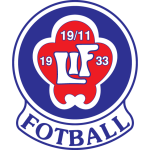 On closer inspection of the crest below, an “LIF” is visible inside an odd curvy shape within a circle, strangely along with the date 19/11/1933; strange because the club was founded on April 17th, 1929, through the merger of Lørenskogkameratene and Solheim IF. The delightful word “FOTBALL” sits underneath (we are also big fans of very similar translations of the word “football” in non-English languages). The mysteriously mismatched dates theme continues with the fact that the year “1924” is also patterned into the fabric – visible above to the bottom left and right of the crest – along with a 3D “UMBRO” motif – also visible above beneath the crest. 1924 is of course the year that Umbro were founded, at least explaining this one. 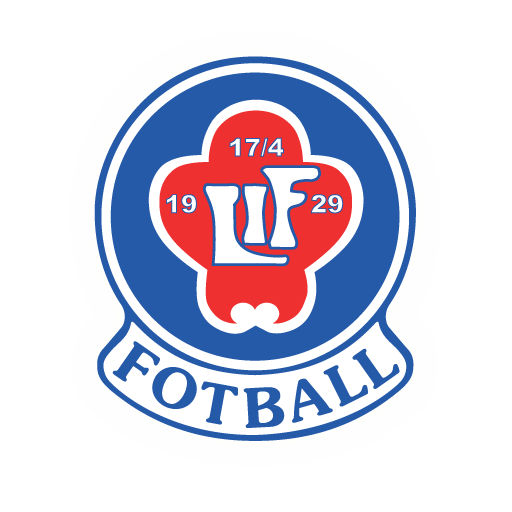 But as for 1933, could this have been when the team were first entered into the Norwegian league, or when the crest itself was designed? We don’t know, but as always please get in touch if you do and we will fill in the explanation here. Going back to the shirt itself, and through a post on OldFootballShirts.com we can see that the senior team used the same template and that the shirt is apparently from the 2001 season, so that is what we are going with for the year of shirt. 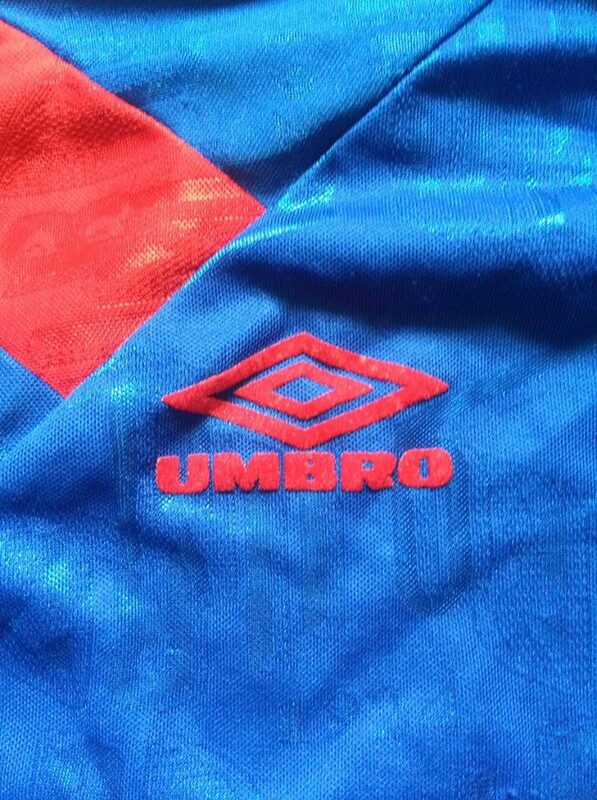 Our original guess had been circa 1998, as this was when Umbro were reintroducing the double diamond logo to their shirts, albiet more usually in miniature beside the wordmark. The diamond taping, originally seen in the ’70s, had also made a return, also seen on the likes of the Manchester United jersey. But unlike United, here we have the addition of dual diagonal bars – in our eyes a welcome interruption to the taping, limiting it to the shoulders rather than full sleeve. The red collar and cuffs with white trim are a sheer delight, and the collar itself employs a smart one button system to fasten (from the below shot we can also see that there is no label on the shirt). This use of white, as well as on the shoulders, gives the jersey some much needed “pop”. It is unfortunate that a similar thought process regarding the white trim hadn’t go into the crest, although it was most likely far cheaper to have it printed on monochromatically. The rich red of the Umbro logo – felt, of course, rather than the printed crest and sponsor of choice which came later- displays a similar issue as it is not wholly legible to the untrained eye from a distance. It’s chunky, furry goodness, however, is extremely satisfying. Adding more white, though, is the main sponsor: COOP, presumably as in “Cooperative”, which appears to be a supermarket chain. The fact that it is kind of reminiscent of a “CCCP” across the shirt gives it extra point from us. 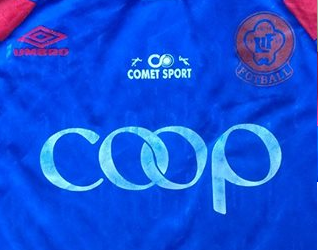 While COOP was replaced on senior team shirts with another sponsor, the secondary sponsor did appear on both: Comet Sport. 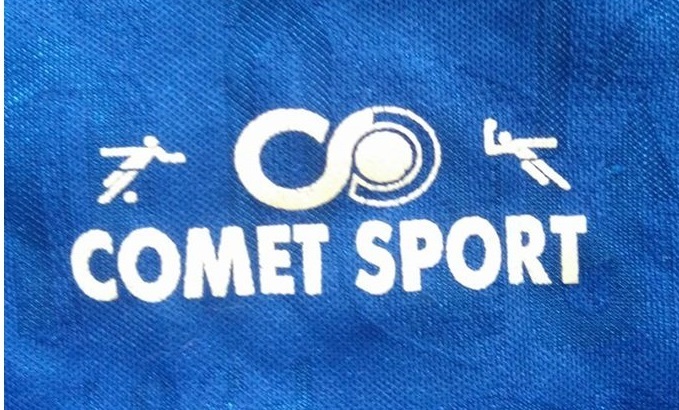 Comet are a Norwegian sportswear chain, as their athletic stick figures represent, one of which seems to be diving desperately for a dramatic table tennis shot. The placement of this logo centrally in the chest, above the other sponsor, is a bit jarring and out of place in our opinion, and would have been better left free for potential cup final details, which admittedly would have been extremely optimistic and a huge loss of revenue. Finally we come to the back of the shirt and Comet make another appearance here, inside the number, which for the second time in this series is a “boxed” 7. With the white again balancing out the red stripes, it is a nice size and not much else needs to be said. Nice. Overall, the shirt has a lot of taking points and some nice features. As mentioned earlier, blue/red/white will always be a POTP favourite, and the cuffs, collar, felt Umbro, long sleeves, and number on the back are all major pluses. 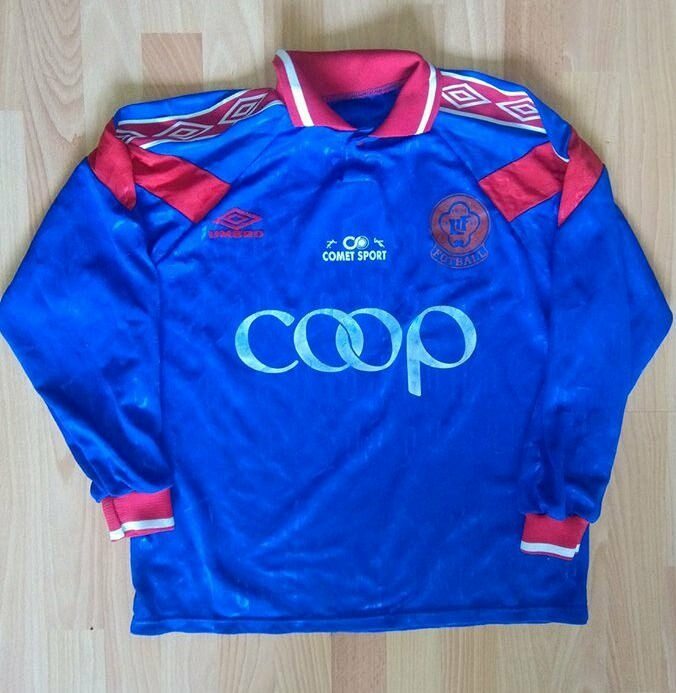 The main drawbacks are of course the fact that the shirt is too small to wear (at least for this writer), meaning it is merely a “collectable”, along with the slightly illegible crest and irksome second sponsor. As always, these are not major critiques, and like all shirts in football it is what it is, you can’t change it, and it is a part of history. For this episode’s International Selection, it just seemed right to pair these two shirts together due to colour, style, year and country. They seemed especially appropriate to include with the above youth jersey, as both shirts are child sizes from the ’90s and were recently rediscovered in the POTP attic. 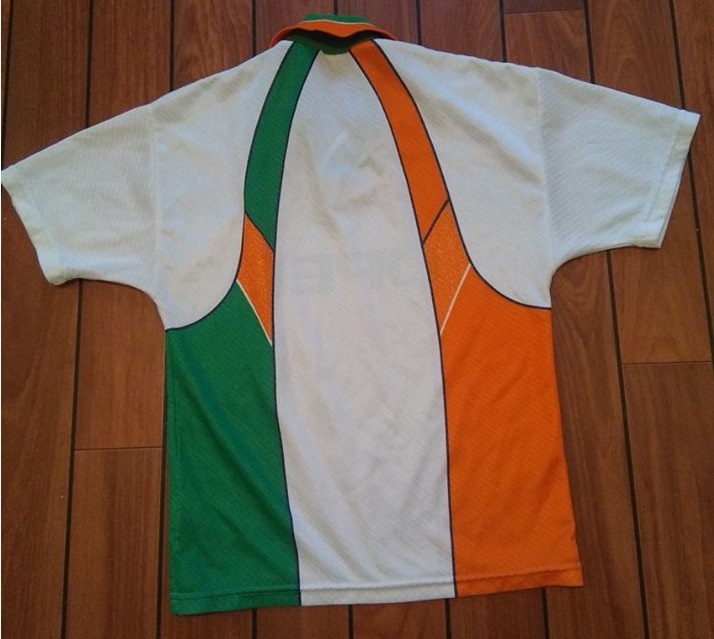 Here we have the marvelous Irish away shirt used at World Cup ’94 (admittedly not so marvelous to some prudish purists, but we’re the bold and brave type of purists), featuring three giant bars “disintegrating” down the shirt and a nice mix of white, green and orange – easily the most usage of orange on an Ireland shirt, home or away, until this point. The crest is probably the 2nd best Irish crest of all time, behind the one which preceded it at Euro ’88 and World Cup ’90 (for more info on said crest’s even longer history, click here), although purists would again probably argue that the original shield and shamrocks Irish badge tops both. This is also of course a replica version, hence the inclusion of the OPEL sponsor. 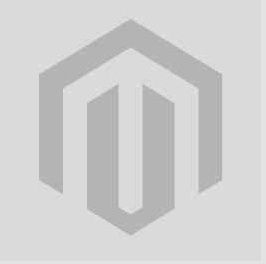 From a purely aesthetical point of view, and just accepting it for it is, this adds to the shirt in our opinion (we like to imagine it as a hypothetical club jersey) and while the orange employed does clash slightly with the orange outlines of the large vertical stripes, there wasn’t really any other option given the nature of the design. A diagonal shadow stripe goes runs across the shirt, along with a faint but complex FAI pattern which can just about be seen (if not “made out”) in the image below. The Irish flag adorning the sleeve is a fun addition. Why not? 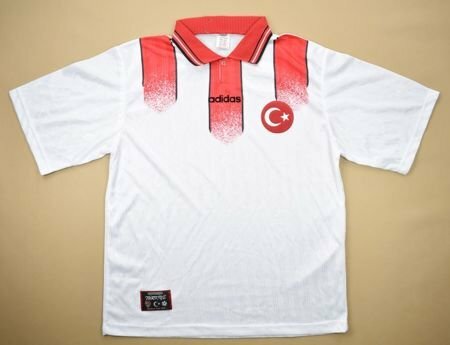 Somewhat strangely, due to circumstance, the shirt was debuted and used in three consecutive games during the 1994 World Cup (a loss to Mexcio, a draw with Norway and a loss to Netherlands), before never being seen again. 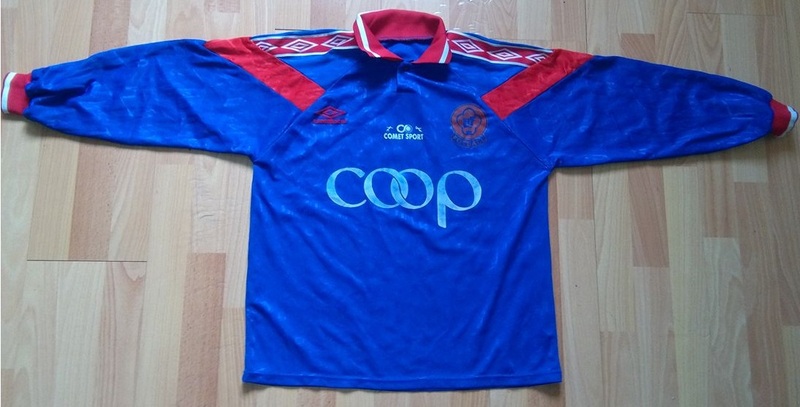 It was the only one of it’s kind for this template at the tournament, although a similar design was also later used by the likes of Turkey, Stockport County, and Karlsruhe SC, all in 1996. 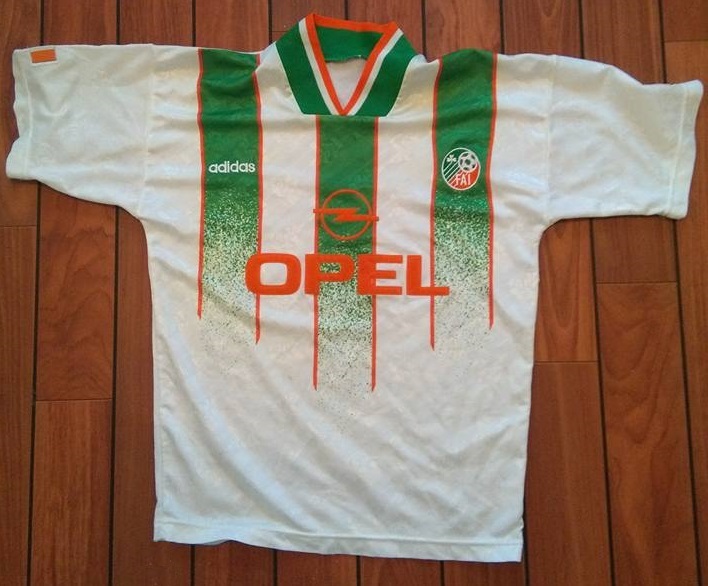 Of course the reason that the above shirt was never to be seen again for Ireland was because after the World Cup the team’s kit deal switched to Umbro, meaning that it had been destined only to be worn at the World Cup. Ireland used their new Umbro home kits for the next two games, Euro qualifiers against Latvia and Lichtenstein. 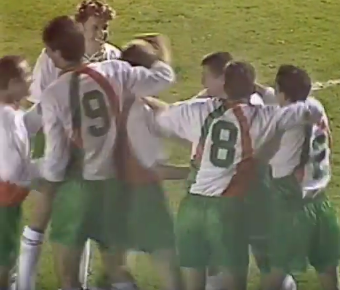 But an away tie to Northern Ireland in the next game presented the first need for the new away kit, with the shirt featuring strange, navy-trimmed orange and green bars emanating for the collar and widening as they go down, filling out the sides of the shirt. 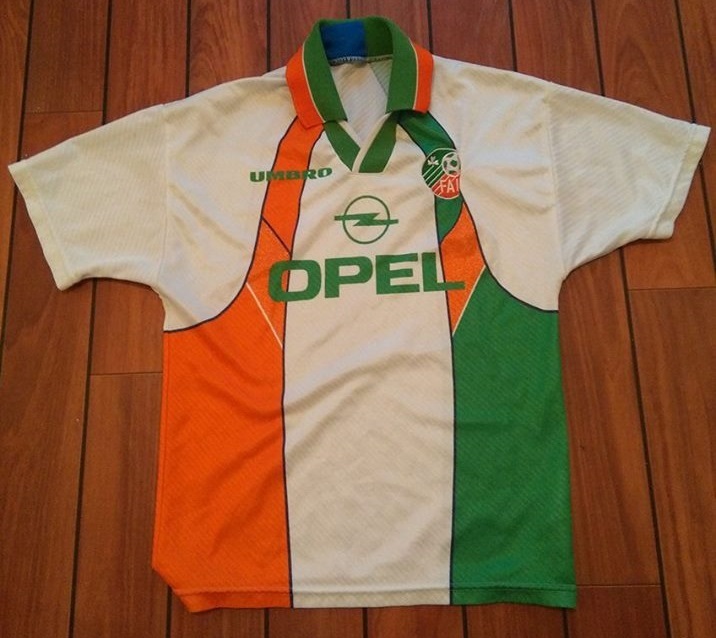 Orange was clearly employed even more liberally that on the predecessor, comprising nearly a third of the shirt, and this trend would continue as the next Ireland away shirt would in fact be orange, and much maligned. As for this one, the positioning of the orange on the left is also quite strange as the bottom half of the shirt hence makes out the flag of the Ivory Coast. The out of place orange section in the middle of the green bar was apparently included so that the OPEL, now in green, would not clash where the L partially covered it. 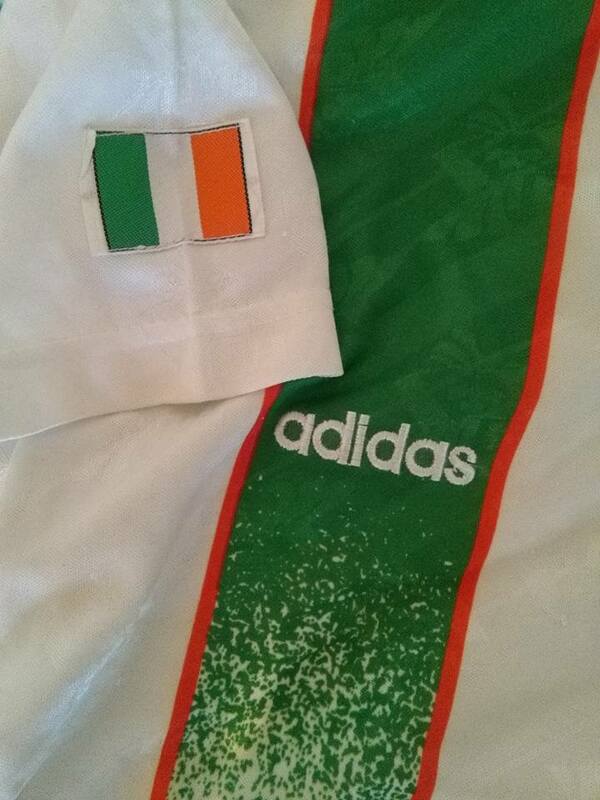 On the back of course, the “flag” is reversed giving us an actual Irish tri-colour. The orange section on the green bar remains for continuity with the front. 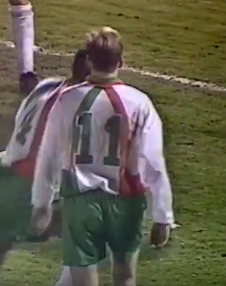 On the backs of the actual player’s shirts, green numbers were used which fit nicely in the white middle, but the inevitable clash of the naturally wider double digits was remedied with a white border on the numbers. 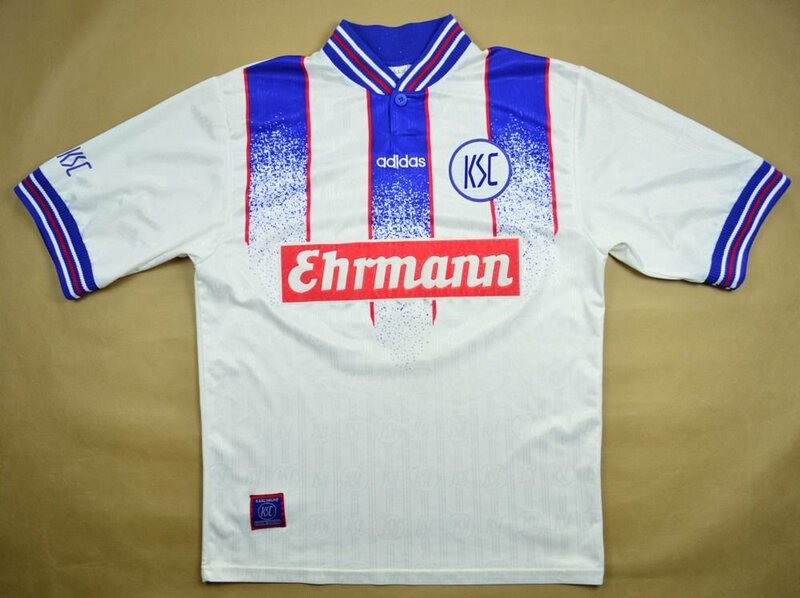 There was little need for the shirt after this, although it did make a reappearance against Bolivia in the 1996 US Cup. Although slightly ludicrous, we loved it at that time of childish, blissful ignorance, and so it takes it’s place here in the hallowed halls of Retro Shirt Reviews.